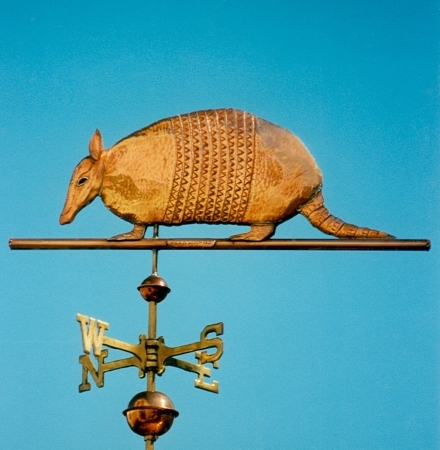 This Armadillo Weathervane is crafted of copper, with distinct tooling to mimic its armored plates and scaly tail. The glass eye gives it a realistic look when the sun glints through it and is available in a nice selection of colors. As with all our weather vanes, this Armadillo can be personalized with the addition of optional gold or palladium leafing, to maintain some light bright areas as the sculpture piece weathers and patinas over time. Native to South America, Armadillos are small placental mammals, known for having a bony armor shell. The nine banded armadillo reached North America in the late 1800’s, though it is unknown as to how and when they crossed the swamps of the Darién Gap. Today they have made their way from Texas to Florida and South Carolina.